This decanter (a vessel for serving wine at the table), designed by C.R. 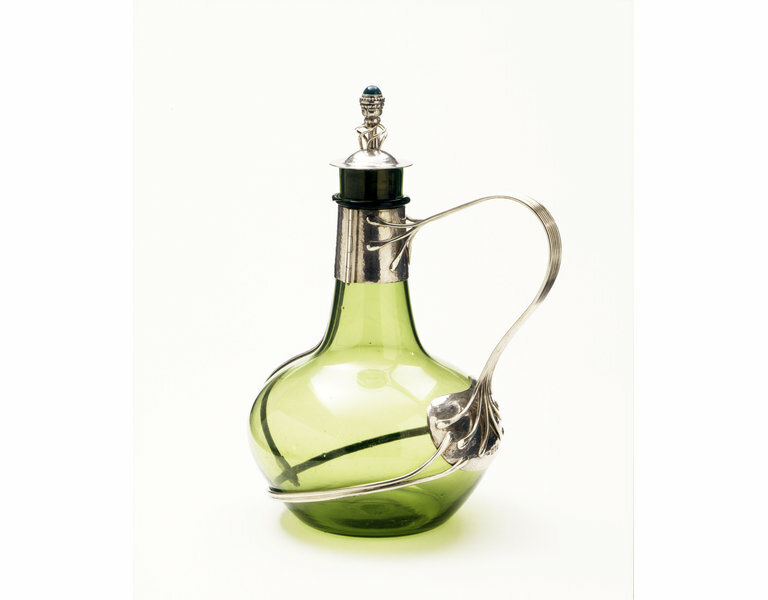 Ashbee (1863-1942), is a type of late Victorian glass decanter sold as a claret jug. All but the cheapest of these were decorated by faceting or cutting. Ashbee's design is distinctive in that it is much plainer. The decanter is simply constructed: the silver wires are soldered into place without disguise or refinement. The ornament is concentrated around the finial (decorative knob). Otherwise the metal is left plain. The hammer marks on the surface bear witness to the fact that it was handmade. The green glass bottle was manufactured by James Powell & Sons of Whitefriars, London. Their version was more fragile and elegant than the Elizabethan prototype. Ashbee designed different versions of this decanter, based on the form of an Elizabethan bottle discovered during the building of his house, the Magpie and Stump, in Cheyne Walk, Chelsea, London. The site had once been an Elizabethan hostelry. Ashbee is quoted as saying, 'it was doubtless bottles of that shape, good solid glass, from which Falstaff [a character in William Shakespeare's plays] and his worthies drank their sack [sherry]'. This romantic view of history was a characteristic feature of the Arts and Crafts Movement. Green glass bottle, almost certainly by Powell of Whitefriars, with a flange almost three quarters of an inch below the lip. Below this a collar of silver, hinged on each side, to which is attached the six splayed terminals of the wire handle, which then run together until just before reaching the kidney shaped plate on the bowl of the decanter. The plate is kept in shape by a double row of wires, which pass around the bottle and bifurcate as they reach the plate. In the centre of the double row, a hinged strip rises vertically to join the collar. Domed lid with flat border and a shaped finial decorated with leaves and two rows of pellets, with a cabochon chrysoprase set in the top, supported on a tubular sheath and surrounded by spiralling wires. The tube conceals a screw fitting which passes through a cork and is secured by a nut attached to a circular silver plate and shielded by a loop of silver, rounded on the outside. 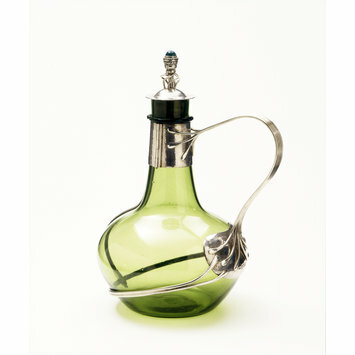 Ashbee designed several variations of this decanter, based on the form of an Elizabethan sack bottle discovered during the building of the Magpie and Stump in Cheyne Walk, Chelsea, which was the site of an Elizabethan hostlery. Variations are illustrated in Modern English Silverwork and in the Guild of handicraft catalogues issued after the move to Chipping Campden. In the earlier versions of this design, the wires of the handle interlace instaed of running in the same plane. 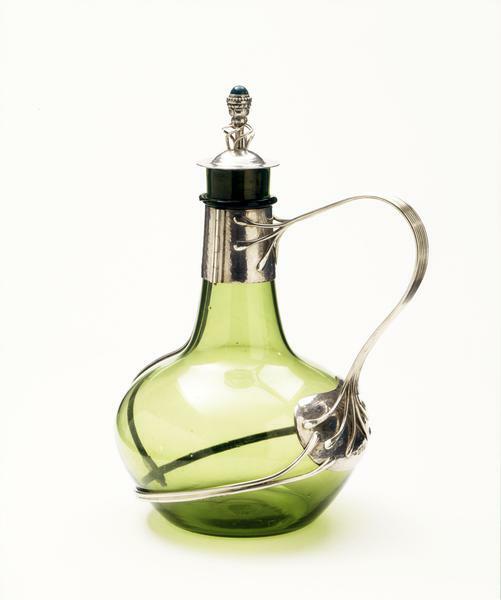 Silver-mounted green glass decanter, the lid mounted with a chrysoprase, London hallmarks for 1904-05, mark of the Guild of Handicraft Ltd., designed by C.R. Ashbee. Eric Turner, An Introduction to English Silver, London, HMSO., 1985, p.37. ill.